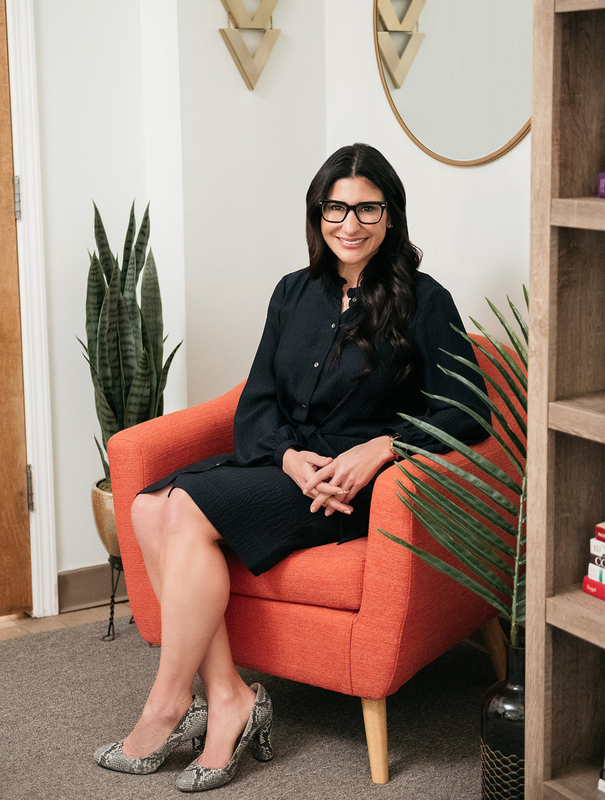 Our boutique Lincoln Park counseling practice works with each individual to help them build on their strengths and help them attain the personal growth they are seeking. This is accomplished by adhering to our practice’s central values: compassion, empathy, and courage. We work with emerging adults, adults, couples, and families from diverse backgrounds who experience a wide range of anxiety and depressive disorders. Our areas of expertise include treating anxiety, depression, and relationship issues. Our therapists have specialized training to treat relationship issues, life transitions, post-traumatic stress disorder, difficulties in emotion regulation, and addiction. As a Certified Daring Way Facilitator™, I am skilled in delivering the curriculum of Brene’ Brown’s research on courage, vulnerability, and shame. Together we will examine the thoughts, emotions, and behaviors that are holding you back and identify new choices and practices that will move you toward more authentic and wholehearted living. The primary focus is on developing daily practices that transform the way you live, love, and lead. My areas of expertise include counseling young adults, adults, and couples experiencing life transitions — identity, employment, geographic and relationship changes– and the difficulties they present. I work with individuals and couples to communicate better and learn the skills to begin building more fulfilling and healthy relationships. I have expertise and interest in working with young adults experiencing a quarter life crisis. I also enjoy working with visual, performance, and musical artists. I view therapy as a collaborative experience and seek to help my clients feel comfortable, hopeful, and truly understood. With a goal-directed approach, I tailor treatment to the needs of the individual by incorporating a variety of therapeutic methodologies. I believe that trust is an essential component to the therapeutic relationship, and I respect and honor, without judgment, what you share in session. Through creativity and warmth, I work with clients to facilitate change and personal growth. My field of expertise is working with young adults in transition who are feeling uncertain about employment, relationships or future– a quarter-life crisis. I enjoy working with individuals who are experiencing anxiety, depression or relationship challenges. My other areas of interest include working with individuals who have experienced trauma and coping with the difficult emotions those experiences bring. Therapy offers the chance to explore and identify your goals in a safe, non-judgmental space. I tailor my work with clients to fit their individual needs, while also ensuring that he or she is feeling encouraged, safe, and understood. My goal is for clients to come into session knowing that they will be heard, that they can trust me, and that they will know that they are on a collaborative path to reaching their goals. As we work together, we will discover self-awareness while building the skills for you to cope with anxiety and depression, transition through life’s changes, and use effective communication skills and understanding in relationships. I work with young adults and adults who are experiencing anxiety, depression, trauma, and relationship challenges. I also have experience working with the LGBTQIA community in regards to coming out, sexual and identity development, transgender, and transitioning. There are many moments where extra support can make all the difference in the world. I became a therapist because I think human connection is essential to growth and well-being. We could all use someone to support us through life’s tough moments. I love being able to build on client strengths and help with perspective taking. In my work with clients, I focus on collaboration and building a strong therapeutic relationship. When we work together, we will focus on your strengths and self-acceptance to create sustainable, meaningful change. I work with individuals experiencing anxiety, depression, transitional issues and relationship struggles. I also work with couples to build effective communication skills and grow as a couple. There are so many factors that determine who we become as adults. Everything from what our relationships were like as children, what our school experience was, and what our innate strengths are play a role in shaping us as we grow and mature. I became a therapist to help people connect the dots that made them who they are today, and learn how to let go of things that do not serve them. I work with individuals and couples, and specialize in: people experiencing anxiety, depression, trauma, grief and loss, and difficulty adjusting to major life changes. My area of expertise is working with young adults who are going through a Quarter Life Crisis or significant life transitions, such as graduating from college, starting their first job, starting or ending a serious relationship, or contemplating other major life decisions. As a therapist, I use a strengths-based approach to help clients increase their mindfulness and create positive change in their lives. I offer a warm, compassionate, and non-judgmental approach to exploring maladaptive thoughts and behaviors, while also helping clients identify and build their strengths, in order to achieve holistic healing and well-being so that you can live a more meaningful life. I work with individuals experiencing depression and anxiety, relationship and self esteem issues, as well as grief, loss and trauma and how to manage the difficult emotions these experiences elicit.